The Alverno Fire Department is a tri-township (Aloha/Benton/Grant Townships) covering an estimated 153 square miles in Cheboygan County, Michigan. Two fire stations are located in Benton Township, Two in Grant Township and one in Aloha Township. The Fire department currently has 34 members with a command staff of one chief, one assistant chief, and five captains. The seven member fire board consists of two appointed officials from each township, and one private citizen from Benton Township. In 2011 the fire department responded to (132) emergency runs. 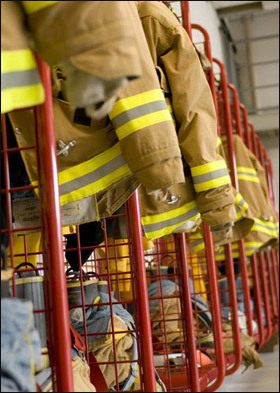 Your fire department personnel and governing board continue to strive to improve fire protection for its residences through ongoing training, equipment upgrades and safety programs. The department has recently earned a new ISO’s Public Protection Classification in the fall of 2010. This new classification will affect property owners in each of the three townships. Any residents living within five road miles of one of the five fire stations have seen their classification lowered from a ten class rating, to a seven. However, residences over five miles did not change. Anyone residing within this five mile radius should contact their insurance company and let them know of the new classification — there could be a decrease in insurance premiums due to the lower classification.